Should You Upgrade to an iPhone 3G? iPhone 3G - Is it Worth the Upgrade? The rumor mill surrounding the release of an iPhone 2.0 from Apple had been churning at full speed for the past several months. Then yesterday, at the opening keynote address for Apple's World Wide Developer Conference, Steve Jobs announced what everyone had already guessed. The new iPhone is faster, smaller, and costs less - not to mention all of the additional features packed into its sleek little case. But do all those new bells and whistles mean you should charge out to your local AT&T or Apple store to upgrade your current handset when it becomes available? Let's take a quick look at its feature set. What's the big deal with 3G? For starters, it's much faster than the EDGE network that the iPhone previously ran on. Jobs's keynote address claimed that 3G loaded websites almost 4x as fast as EDGE and just a little bit slower than Wi-Fi. This means your web sites will load quicker, email will appear faster, and you'll experience fewer hangs and delays across the board. The original iPhone should have been built on 3G technology. 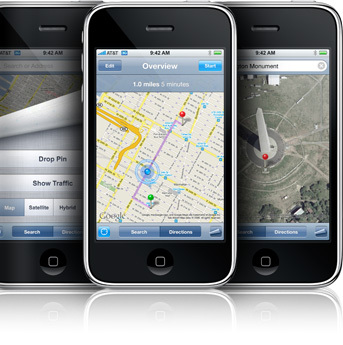 Although the addition of this feature is feared to be a significant drain on the iPhone 3G's battery life, the built-in GPS functionality might just be worth it. Streamlined Google Maps with GPS locator, real-time traffic information, and other location-based services (advertisements for local businesses, etc) are just a few of the potentials I've read over the past few weeks. How did Steve Jobs put it during his keynote? "Exchange for the rest of us," I think. 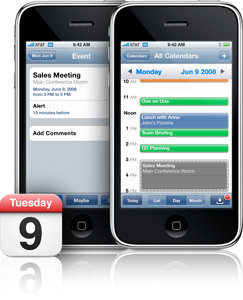 E-mail, contacts, and calendar pushed to your iPhone 3G - all running on Apple's rebranded .Mac service. The new "Mobile Me" from Apple will be an additional charge per month on top of your AT&T service, but offers all the features of .Mac plus the new iPhone integration. Support for Microsoft's ActiveSync for Exchange is now built-in and ready out of the box. Add in support for secure VPNs and WPA2/802.1x security protocols for Wi-Fi access and the iPhone 3G is ready for prime time in the enterprise environment. With the coming of the iPhone Software Development Kit comes the advent of the app store in iTunes. 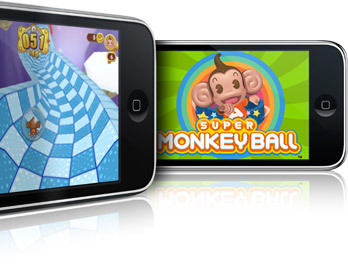 Lots of great Apps including games (like Monkeyball) have been revealed. I'm a little less enthusiastic about this feature, as Apple will control all access to the iPhone by making iTunes the lone mechanism for distribution. That being said, this could actually end up being a benefit in the long run. If Apple controls the environment, they can control th experience and thus ensure the best experience possible (i.e. less crashes from unauthorized apps being loaded, malware threats, etc). I'd say the main draw is the drastic reduction in price - $100. The iPhone 3G 8GB model will start at $199 and the 16GB will start at $299. I'd say that makes them pretty competitive with many of the other smartphone models out there. So should you upgrade your existing handset to an iPhone 3G? I would say that that would depend on your current handset. If you have a current iPhone and you rely on it heavily for web access, email, calendar, then the answer would probably be yes, you should upgrade. The new features and benefits you will get from the 3G connectivity alone will make your life easier. If you have an iPhone and don't find that you use the EDGE connection often (i.e. you are in Wi-Fi hotspots often), then perhaps you could live with just getting the iPhone 2.0 software update. If you are thinking of getting into the smartphone market and don't currently have one, then the iPhone 3G is a great way to do that. The lower price makes it much more affordable and the value for your money way out paces any Windows Mobile phone that I've seen. If you're getting the higher plan it's a free upgrade! Mobile World Limited, We are located and base in United Kingdom, we are selling all brand and latest electronics such as mobile phones, pda, laptop, notebook, ipods, digital camera, gps, plasma television, games at affordable and competitive prices.. we give 1 year warranty for every product sold out to our costumers, our product are company class 1 tested and approved by global standard organization of wireless industries, Brand new merchandise with complete accessories, extra charger and battery. and also we give tracking number and airwaybill for your to monitor your packaged online as its goin to e delivered in the next 48 hours Via FedEx/DHL/UPS..
Nokia n96 16 Gb : $300usd.